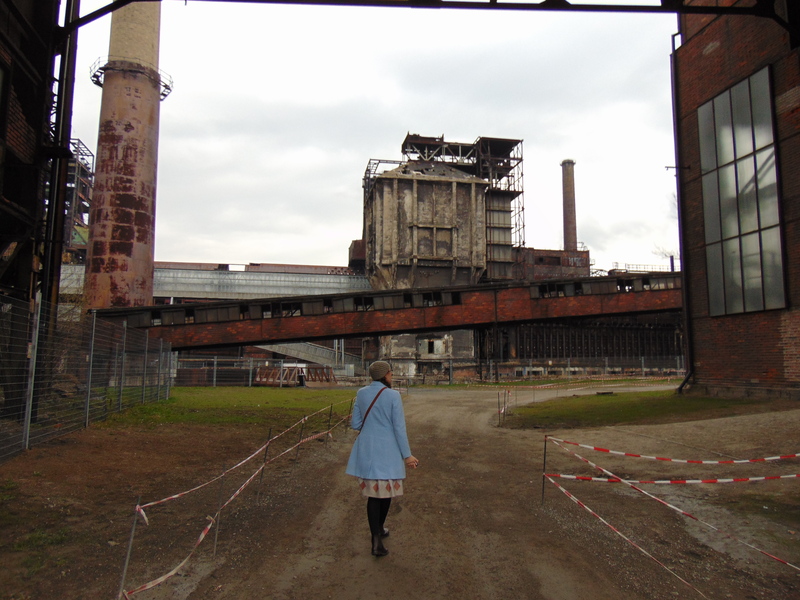 Ostrava is one of the biggest cities in the Czech Republic, so we’d been hoping for an opportunity to visit it. That came when we were making our way towards Poland in the Easter holidays and wanted somewhere to break the journey. We didn’t even have a full twenty-four hours, but we got some good sightseeing in. Alas, because it was Easter weekend, there weren’t an abundance of dining options for us. Ojero Vegan Bistro (UPDATE: closed 2017) was the only 100% vegan place open, and we were keen to give it a try. Because most other meat-free places were closed for the weekend, they were running a little low on supplies on Saturday evening. We ordered two burgers, but the waitress returned to apologise and say they’d just given the last bread buns to some other customers. Boo, selfish other customers, beating us there! (The burgers went past on their way to the table, and they looked big and hearty.) A few other customers who’d arrived at the same time as us left when they heard this news, but we stuck it out. 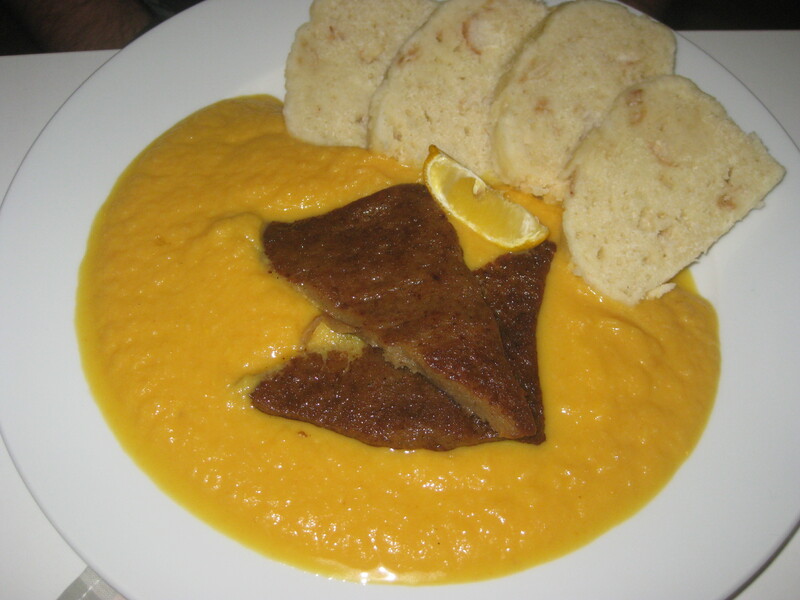 Only their traditional Czech dishes were still available, and we always enjoy those. Dr HH had the svickova, which we’ve had a few varieties of in our time here. He said the sauce:solids ratio was not perfect, and that the seitan needed more seasoning, but generally he really liked it. The waitress recommended this dish to me, and I decided to give it a go as I’ve never seen a version of it in Prague. I didn’t catch its Czech name, so I will describe it as smashed potato and oaty beetroot dumpling. It’s a very dry plate, which is my idea of heaven! It was all well-seasoned and extremely hearty, and I hope I’ll see it on a Prague menu soon. If I find myself back in Ostrava one day, I’ll see if I can get my hands on a burger here instead. As for what to do in Ostrava, the town centre has some beautiful old buildings and squares. But as you can see, we went in a different direction. 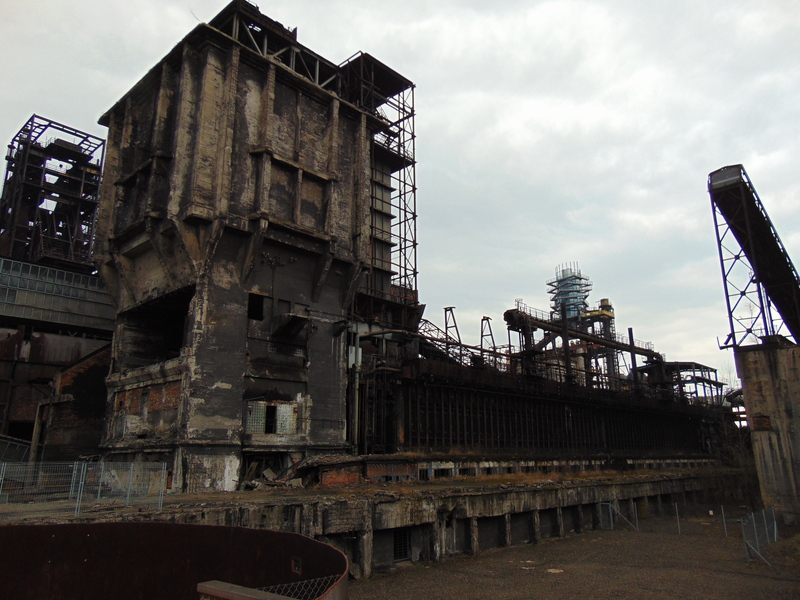 Dr HH’s Czech teacher had recommended a tour of the disused steelworks, but we had dismissed it as not worth paying for. However, we saw it when we got off the tram and decided to do our usual “see how far we can get without paying for a ticket” act, and found that we could actually saunter round for free. My hometown also has some steelworks, now sadly disused as well. I think every male relative before my generation worked there at some point, and indeed it kept a lot of local people employed, so its loss has certainly been felt. Because of that homely connection, I really enjoyed seeing the steelworks here, and thought it a little sad to see them in ruin. I wonder if Ostrava is facing the same problems as Redcar. 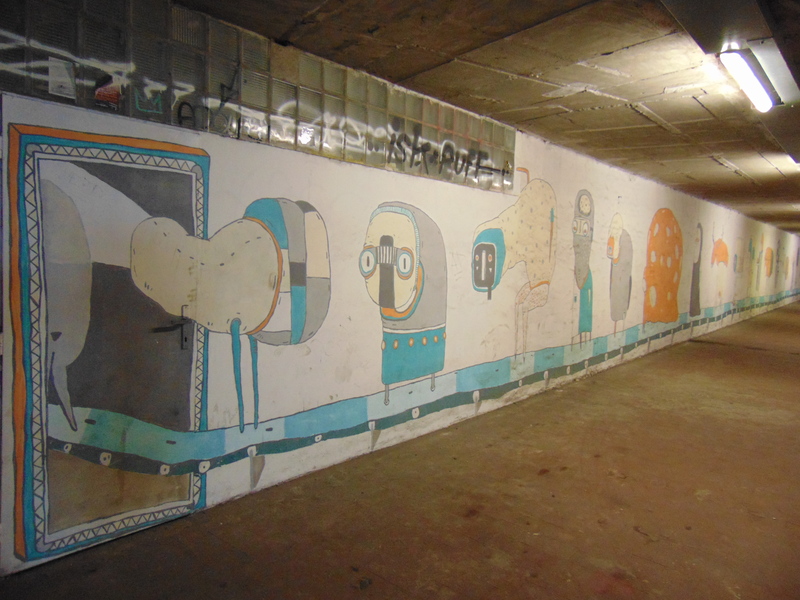 As a little bonus, the subway leading to the steelworks was covered in street art. 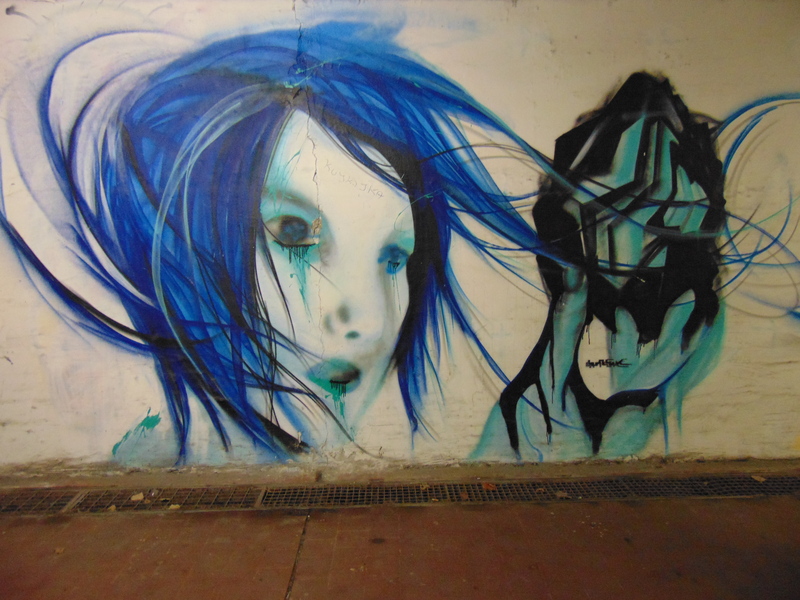 We enjoyed the blue-haired lady and the conveyor belt of creatures. 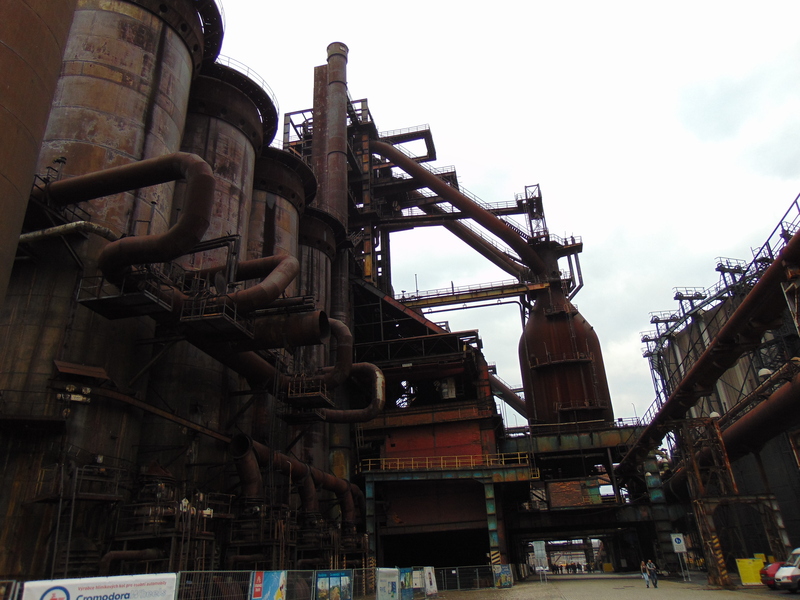 Both the art and the steel were sides of Ostrava that we hadn’t expected to see really, so they were pleasant surprises. 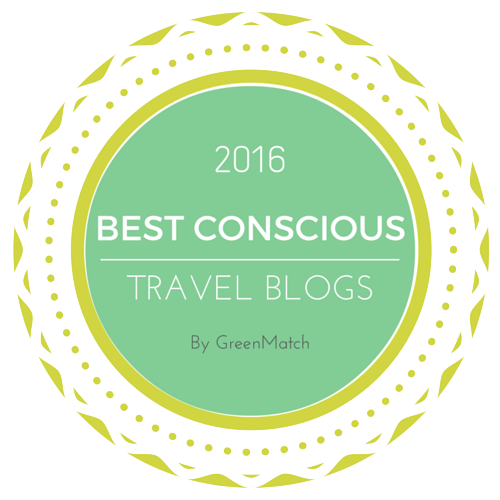 This entry was posted in Travel, Vegan Mofo and tagged Ojero Vegan Bistro, vegan mofo, vegan Ostrava, vegan travel, vgnmf16. Bookmark the permalink. I for one was glad you missed out on the burgers so that we could see some tradional Czech dishes, intrigued about the beetroot one too. Yes so much forgotten history in past steel industry. 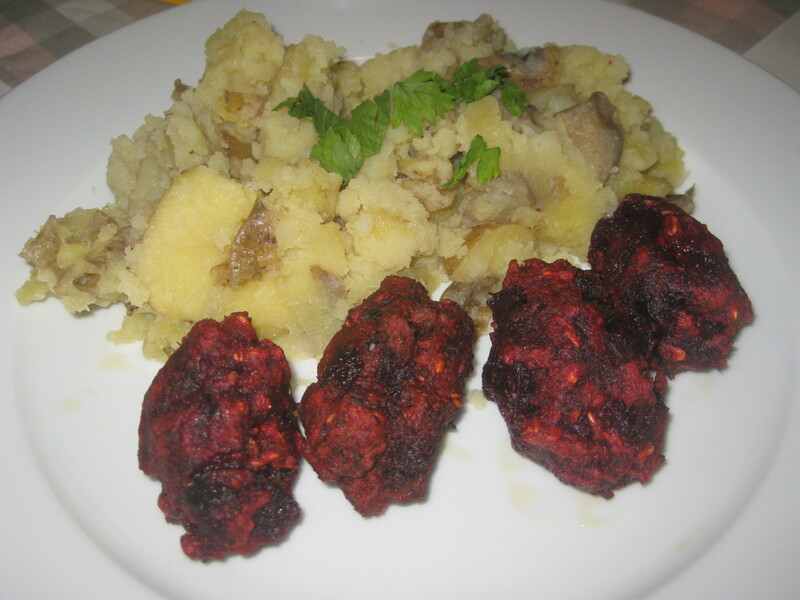 It’s true that the Czech dishes seem more exciting and exotic! Aw, that’s a shame. We really hadn’t been expecting to be so impressed by the steelworks here, but we were.